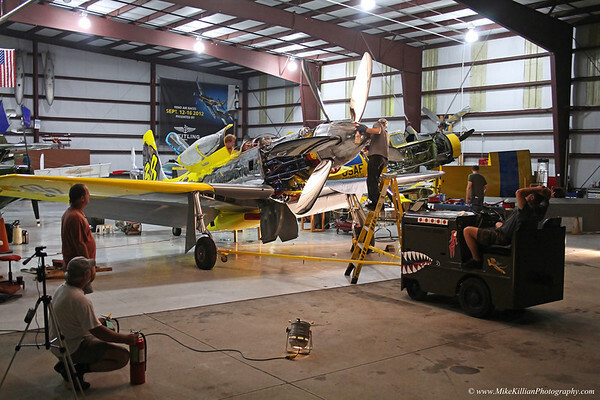 Behind the scenes with Thom Richard and the team at Warbird Adventures of Kissimmee, Florida as they prepare their P-51 racing Mustang "Precious Metal" for the 2013 50th Anniversary Reno Air Races. The all-volunteer team of pilots, engineers, & mechanics put in over 7,000 man hours over the course of the year to prepare Precious for the fastest motorsports race in the world. Precious Metal is a true one-of-a-kind, the world's only Rolls Royce Griffon powered P-51 Mustang. These images do not do justice to their dedication, long hours, tireless effort, blood, sweat, and tears, but gives the viewer a rare look at some of the folks who keep Thom & his bird in the air year after year. Unfortunately I could not follow with the team to Reno this year due to other commitments I had back in Florida at the same time as the races. Check out the official Precious Metal Fan Page on Facebook! All photos © copyright 2013 Mike Killian Photography, all rights reserved.